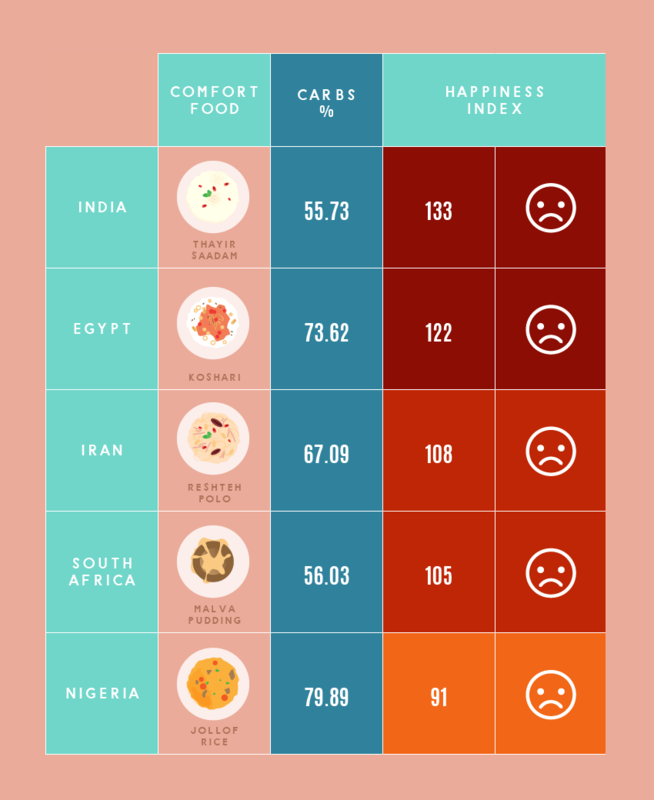 Comfort foods are meant to make you happy – we wanted to see how the happiest nations were affected by the nutritional breakdown of their comfort food. Everyone has a favourite comfort food, that go to snack or meal to make you feel better when your day has been far from ideal. This idea however that comfort food can improve your mood is an interesting one, especially since a lot of the meal choices are seemingly quite indulgent. With a mission in mind, we set out to take a look at the correlation between comfort food and whether it really does have an impact on your happiness. We started off by gathering information about the world’s favourite comfort foods. We wanted to see how comfort food differed on a country by country basis and were somewhat surprised at how varied the food types were. Ten comfort foods were traditional main meals, four were rice/cereal-based snacks, three were desserts, four could be classed as side dishes or snacks and four were soups. There were a much broader range than we probably expected. We then decided to use the Happiness Index to find out which nations were the happiest. To see if there was a correlation between the happiest countries and the healthiest comfort food, for example, we decided to look at the nutritional breakdown of these popular food types. Was the happiest nation’s eating comfort food with more fat, or were carbs the key comforter? Was there a secret ingredient that could be identified as the ‘source of comfort’. Listed below is each country’s go to comfort food dish around the world, complete with the breakdown of their nutritional content. With low serotonin levels linked to depression and carbs said to trigger serotonin release we did suspect there might be a correlation between comfort foods high in carbohydrate content and the most happiest nations. We actually found comfort foods for nation’s lower down the Happiness Index contained a larger percentage of carbohydrates. We found that the bottom five countries on the Happiness Index opted for comfort foods with less fat, but the foods also contained less protein. 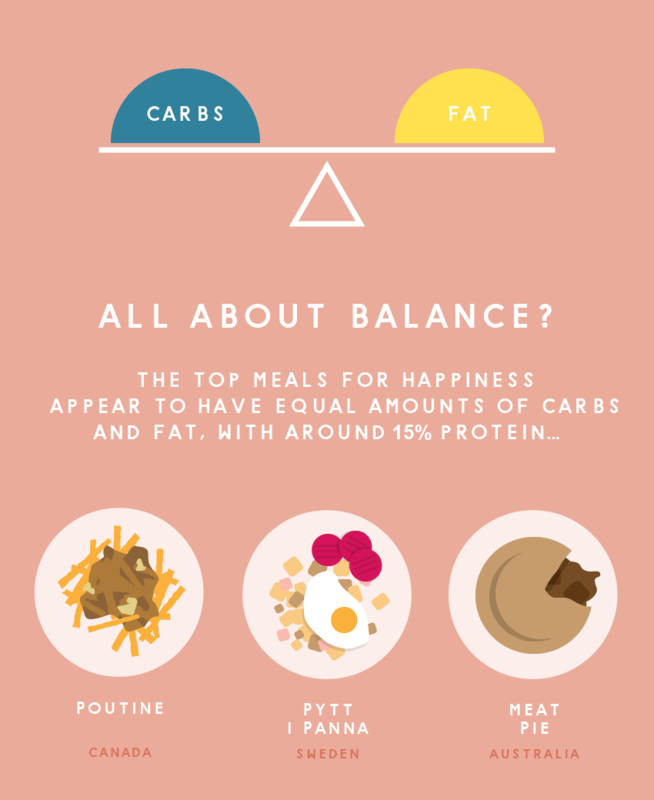 This didn’t mean however that less carbs, more protein and high fat content was the key to the happiest countries, in fact we found that happiness was more likely to be associated with a balanced diet. Comfort food that had an equal amount of fat and carbs, and around 15% protein were found to be the most comforting. You may be wondering what kind of food fit this bill and made people the happiest… Stew. Stew is the comfort food that provides the greatest happiness. Australian’s with their meat pie dish, the Swedish with their Pytt i Panna dish and Canadians with Poutine all fit the bill with their comfort food choice. If you were wondering why foods too rich in carbohydrate were low down on the happiness scale when less serotonin is linked to depression and anxiety, well for one high levels of serotonin can cause diarrohea and vomiting. Serotonin is also used to help regulate digestion and when something doesn’t agree with us, more of the hormone is produced making our digestive system respond faster. Serotonin is also used in the body when healing wounds, platelets in the blood release the hormone to help arteries contract and reduce blood loss. Too much can lead to bone weakness and osteoporosis. Serotonin can also make you crave sugar and feel down about ourselves. Too little serotonin can lead to depression but too much comes with its own consequences too. How Healthy Are Comfort Foods?